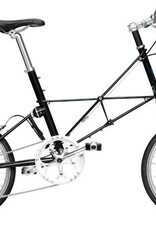 The Moulton TSR 9 is a light, versatile machine with all the defining Moulton features. At home, in town or on the trail, it can handle all but the steepest of terrains. A seperable frame allows for the bicycle to be easily transported or stowed away with no compromise to the stiffness or ride quality of the frame. Seperation takes no more than 3 minutes. Dry Cone Suspension- The hollow cone shape reacts to load the rubber in compression and shear, providing a smoothly rising spring rate with integral damping. A separate floating fork stirrup in used to keep unsprung weight to a minimum, damping and ride height are adjustable. Suitable for inside leg 27-36". 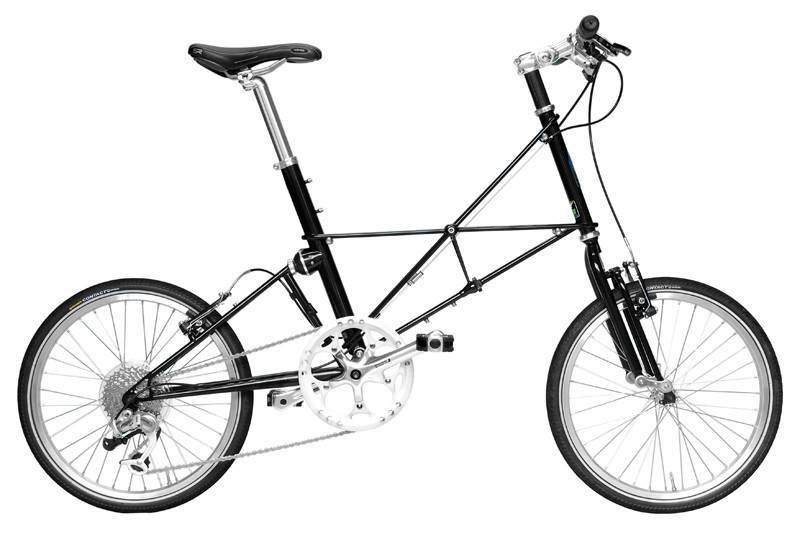 The Moulton tunable suspension allows the advantage of very strong, rigid wheels and high pressure, low rolling resistance tires, while still providing a more comfortable ride than a conventional bike. The suspension also improves and maintains traction on rough surfaces. Small wheels don’t ride slower. In fact, they accelerate and turn much quicker than their large diameter brethren which makes these bikes just plain exhilarating to ride. Compatible with all TSR racks and accessories. Gearing is provided by SRAM Dual Drive rear derailleur, trigger shifter and 9-speed 11-32 tooth cassette. Gear range is 32-94 gear inches. Wheels are made up of a Quando KT 36 quick release front hub, stainless steel 14G spokes, silver alloy rims with CNC sidewalls, and Continental Contact 37-406 tires (1-3/8"x20"). Braking provided by Avid Single Digit 5 v-brakes and Avid FR-5 brake levers. Comes complete with Selle Royal Viper gel saddle, VP607 alloy/rubber tread pedals, Kalloy aluminum double-butted handlebar, and Uno adjustable 90mm stem.